US lawmakers say they were 'shocked' by the treatment of non-Muslims on Judaism's holiest site. 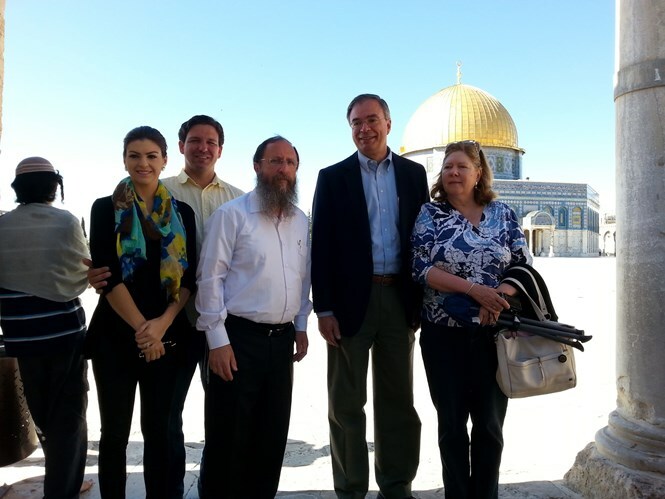 In what has become something of a trend, two US congressmen participated in a fact finding mission on the Temple Mount early Wednesday morning, to witness firsthand the discriminatory treatment meted out to non-Muslims on Judaism's holiest site. 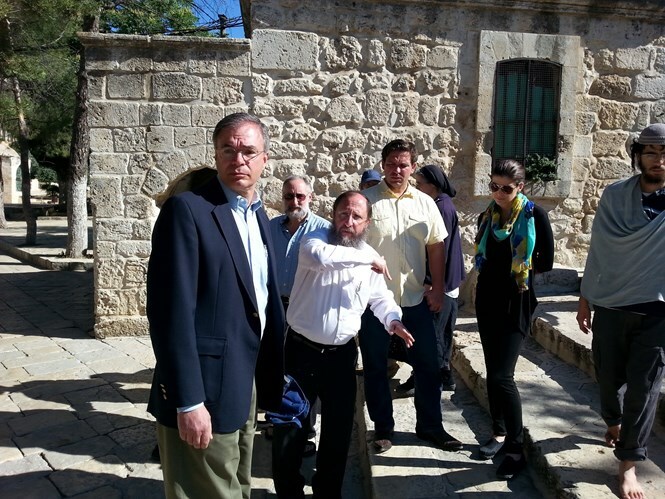 Congressmen Andrew Harris (R- Maryland) and Ron DeSantis (R-Florida) were taken on a tour of the holy site in Jerusalem by Rabbi Chaim Richman, International Director of the Temple Institute, who pointed out religious and historical landmarks along the way. The American lawmakers were also accompanied by their wives. The group witnessed how Jewish groups are singled out and closely followed by "guards" from the Islamic Waqf trust which administers the site, as well as Israeli police officers, both of whom scrutinize their behavior for any signs that they might be engaging in Jewish prayers or any other non-Muslim form of worship. In addition to the usual entourage, the Congressmen were also followed by an Israeli intelligence officer who filmed their every move for much of the visit - perhaps an indication of the attention which previous visits by US lawmakers to the site has drawn. Both were clearly moved by the experience and expressed concern at the lack of religious freedom for both Jews and Christians on the site. The Temple Mount is Judaism's holiest site, where the ancient Temples of Jerusalem once stood and where some Jewish traditions say the creation of the world began. 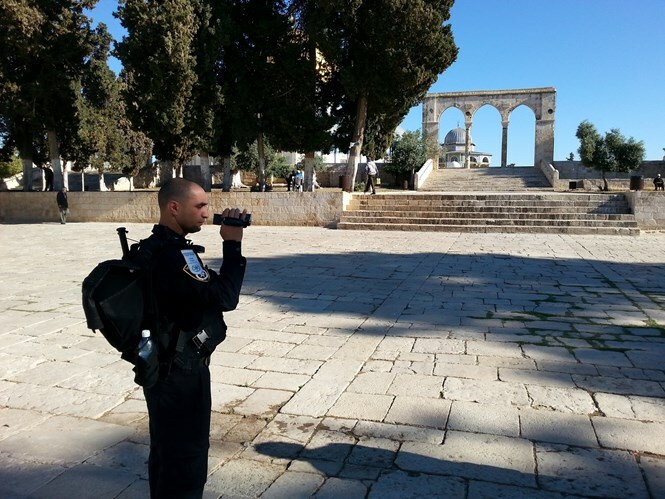 Today, the vast Al Aqsa Islamic complex stands on the ruins of the Temples. The complex is administered by the Jordanian-controlled Waqf, which has been accused of heading a systematic campaign to "Islamize" the site by destroying ancient Jewish artifacts. Despite its status for Jews worldwide, those Jews who wish to ascend are subjected to a range of restrictions, including time-limits on their visits and the number of Jews allowed to ascend at one time. 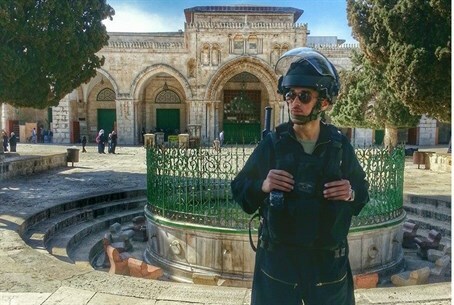 Most notably, caving in to pressure by the Waqf and other Islamist groups, Israeli police forbid Jews from praying or carrying out other forms of worship there, in what Temple Mount groups have slammed as discrimination and a capitulation to Muslim extremists. Those suspected of breaking the rules are often arrested and banned from visiting for a period of time - this despite numerous court rulings stating that such measures contravene Israel's Basic Laws concerning religious freedom. Congressman Andrew Harris expressed his concern at the lack of religious freedom on the site. "It's a pleasure to be here on the Temple Mount, obviously an area of religious significance for many religions including Christians like myself, Jews and Muslims…but I'm actually surprised that access is so limited and especially the discrimination against Jews above any other religion in visits to the Temple Mount. It surprises me as an American, believing in religious freedom, that [such conditions] would exist." Rabbi Richman, who has spearheaded the initiative to raise international awareness of the situation for Jews on the Temple Mount, explained that by joining a visibly Jewish group the congressmen were able to get a genuine taste of the discriminatory treatment which Jews receive on their holiest site. "It was an honor to guide these two distinguished congressmen and their wives on the Temple Mount, the holiest spot in the world, and focal point of mankind's spiritual aspirations. "The congressmen, as part of a 'Jewish group,' were able to experience first-hand what it is like to be victims of anti-Jewish discrimination. Were Jews to be treated in this manner in any other country, the State of Israel would protest vehemently against such grievous discrimination." The Congressmen are currently in Israel as part of a week long visit organized by the Yes Israel Committee. The trip was arrange in conjunction with the Yesha Council which represents Israeli residents of Judea and Samaria. In addition to the Temple Mount tour and visit to Israel's capital, the congressmen will also include trips to Hevron and Shiloh (capitals of ancient Israel prior to King David's conquest of Jerusalem), Ariel University and various strategic outlooks in the Samaria region which overlook 70% of Israel's population.